A profiling and pro-poor targeting tool conceptualized, designed, field-tested and enhanced since 2003. 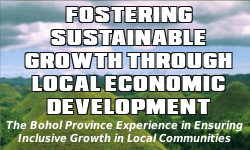 PDMS is used in Bohol in its efforts to address widespread poverty. The tool consists of a customized questionnaire administered at household level which gathers data on core poverty indicators (HEALTH: Water Source, Sanitation, Child Malnutrition, and Child Mortality; ECONOMIC: Income Threshold, Food Threshold, Meal Threshold, and Unemployment; SOCIAL: Housing, School Dropout, Land Tenure, and Crime Incidence). Other information/indicators may be requested such as community and household assets, environmentally-related and gender-specific indicators and micro, small and medium enterprises. The PDMS is a tool initiated by the Provincial Government of Bohol in partnership with the Bohol Local Development Foundation (BLDF). Funding for survey is required from clients as well as a software fee. The software is owned by BLDF. Used in research and local planning.